How unhappy are students at Yale University? It’s arguably the toughest college in the country to get into–and more than half of its students wind up seeking mental health care while they’re there. That might not be a coincidence. A Yale professor says that’s likely because if you get into Yale, you probably had to spend years of your life doing things that made you really unhappy. Striving. Getting good grades. Ensuring that you beat the next person behind you on your high school honors list by a zillionth of a grade point average. I give sincere credit to students for seeking help when they need it, but the state of affairs amounts to a “crisis,” in the words of Yale psychology professor Laurie Santos. So she decided to do something about it–introducing a course that I like to call Happiness 101 for short. Technically, its name is “Psyc 157, Psychology and the Good Life,” covering positive psychology and behavioral change. Regardless, the question of (lack of) happiness has made it into a monster hit. On Day 1, 300 students signed up. Within a week, its enrollment grew to a record-breaking 1,200 students–about 25 percent of the entire undergraduate student body. Teaching such a gigantically popular class brought with it logistical challenges–and apparently, jealousy. First, they had to hire enough teaching fellows at the last minute (24 of them), and find a big enough room on campus. They live-streamed for half the class during the first few weeks, they finally settled on Woolsey Hall, a 2,650-seat auditorium usually used for things like symphony performances. Santos encouraged students to reduce stress by taking it pass/fail, and and doesn’t monitor whether students do homework assignments. “With one in four students at Yale taking it, if we see good habits, things like students showing more gratitude, procrastinating less, increasing social connections, we’re actually seeding change in the school’s culture,” Santos said. Only one problem: So many students took Happiness 101 that it left other professors’ classes empty–or at least emptier than they would have been. And that means the happiness course left other people at Yale feeling unhappy. So if you missed out on Happiness 101, you’ve missed out forever. They’re not planning to teach it again. Whether you use it daily or have heard about it from 10 of your closest friends, you’re likely well aware of Salesforce. The behemoth CRM has become a multibillion-dollar industry leader; unsurprisingly, its founder and CEO, Marc Benioff, is seen by some as the “champion of innovation.” Salesforce is built to integrate with other apps — a fact developers are encouraged to take advantage of — and Benioff backs tech companies with his own money. Benioff’s wagers beyond Salesforce have proved fruitful. These are the 20 investments Benioff has made that are currently among the most successful. As news headlines have proven, cybersecurity has become an increasingly large challenge for businesses to tackle. However, automated threat monitoring could make the task a bit easier for them, and Illumio is among the companies gaining attention for this technology — the business earned a billion-dollar valuation in 2017. AnyRoad specializes in experience relationship management (ERM), which is essentially a CRM for the real world. The brand’s software helps businesses leverage data from real-life brand experiences and empowers companies like Honda, Diageo, and the Golden State Warriors to measure shifts in brand perception and purchase behavior, enabling them to establish deeper relationships with their fans. After its purchase by Nutanix in 2016, PernixData continued to expand the market for its virtual server-side flash memory. While the space has plenty of competition, PernixData’s write caching and clustering set it apart. No stranger to competition in the wide videoconferencing arena, Highfive is elbowing its way out of the pack. One feature that sets it apart is its ability to now be deployed directly from a user’s browser. With more than $63 million in funding, Duetto has grabbed attention in the hotel revenue strategy sphere. A new partnership with GuestCentric stands to push the software platform to the next level, allowing hotels to customize pricing in real time based on a customer’s past behaviors. Believing coding is a big part of the youngest generation’s future, Kano makes the process of learning to code fun for children through kits. The company raised $28 million in Series B funding in 2017, which it put toward releasing its products to retail outlets. Among the acquisitions grabbing headlines in 2017 was Forcepoint’s purchase of RedOwl, which followed at least $21 million raised in venture capital. RedOwl’s specialty is software that detects unusual activity on users’ systems. Vicarious’ advanced AI, designed to improve robotics, has earned the company investments from Elon Musk and Mark Zuckerberg, in addition to Benioff. Among its most recent innovations is technology to improve the CAPTCHA process. With revenue growth of more than 1,500 percent over two years, Rainforest QA’s success has proven that quality assurance testing is a field in strong demand. The QA-as-a-Service platform recently raised $25 million to expand its AI-fueled testing. Domo’s SaaS-based platform helps business leaders transform the way they manage business through direct access to data. The company was named to the 2017 Inc. 500 after growing more than twentyfold in three years. Marketing localization company Cloudwords kicked off in 2010 with $3 million in seed funding, including Benioff’s investment. In April 2017, the global marketing campaign solution partnered with translation productivity startup Lilt. Specializing in next-generation financial management and cloud treasury software, Kyriba Japan recently launched a module dedicated to detecting and stopping fraud as it’s attempted. It can be difficult for busy consumers to sift through the news for the pieces most relevant to their lives, but Nuzzel makes it easier. News items are curated from a user’s social network, which now includes LinkedIn. Marc Benioff’s eye for business means his investments signal the technologies consumers and businesses need to watch. These innovations are proof that Benioff has his finger on the pulse of the software space, and that’s likely to continue as he looks for new ventures to support. By Mattson Newell (@MattsonNewell), Director for Partners In Leadership, an expert and author on Breakthrough Communications, Global Human Resources, and Talent Development. While the initial success of companies like Netflix, Facebook, and Tesla, is, of course, grounded in the fantastic products they’ve introduced to consumers, the leaders of these tech world behemoths recognize that long-term success requires fostering a strong culture of innovation within their companies. In fast-moving industries, leaders must create a culture of learning that keeps employees invested in their work and committed to the challenge of improving upon the status quo. The strategies used by leaders like Elon Musk, Mark Zuckerberg, and Reed Hastings are innovative and unique, but they can be borrowed by leaders from all industries to encourage a sense of creativity and curiosity in their employees. The success of these visionary leaders in creating cultures of learning can be boiled down to five critical strategies. Mark Zuckerberg is passionate about the grand vision that his company is working towards — but he applies that same passion to the everyday, often unglamorous work it takes to achieve that vision. Through frequent appearances on the news and at conferences, as well as through posts on his own personal Facebook page, Zuckerberg is constantly setting an example for his employees, demonstrating to the world how excited he is about the work Facebook is doing. This kind of dedication does more than inspire confidence in shareholders: employees who see that their managers are passionate about what they have achieved are much more inclined to work diligently in pursuit of the company vision. Earlier this year, Elon Musk caught wind of some safety concerns affecting employees in one of Tesla’s plants. Instead of just issuing a new company policy or sending a sympathetic email, Musk asked that moving forward, employees send any and all concerns regarding safety directly to his inbox. On top of that, he promised to personally visit any factory in which these incidents occurred, spending time on the factory floor and observing the process himself to determine what changes could be made to improve protocol. Musk’s decision to lead from the front lines showed his employees that he was committed to their safety and personally invested in improving Tesla’s manufacturing process. It takes the courage to think big to launch a company, but maintaining this mindset remains just as important as your company grows: promoting a culture of innovation and experimentation can help you to maintain your competitive edge for decades down the line. In order to create and implement truly innovative ideas at their companies, leaders must not only embrace change themselves, but ensure that their employees do the same. CEOs like Netflix’s Reed Hastings, for example, understand that ideas for new products and processes are great, but that these innovations will never truly be impactful if they are not seen through to completion. That’s how he pushed his company to make the transition from mailing customers DVDs by hand to streaming all of its video content, a practice that was unheard of until Netflix championed it. Rather than letting this daring idea fall by the wayside, Hastings acted on it, and in doing so ushered in the new normal of on-demand video streaming services. It’s all well and good for managers to encourage their employees to take learning seriously — but the best leaders actually give their employees the resources they need to do it. For example, Google allows its employees to spend 20% of their time each week learning new skills and developing their existing talents. Granting employees the time and space to learn will always generate positive returns for any company. 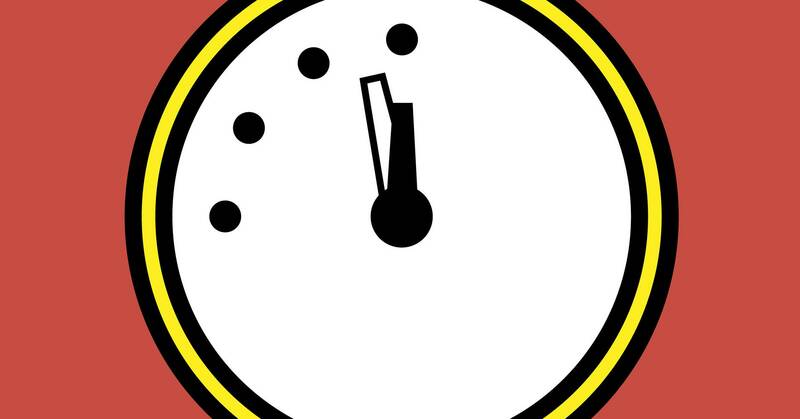 That existential fear was affirmed today by the organization of nuclear scientists who have spent seven decades trying to turn humanity away from nuclear weapons: The Bulletin of Atomic Scientists moved its “Doomsday Clock” 30 seconds closer to “midnight,” an unofficial barometer of how close the world stands to a man-made catastrophe. It now stands two minutes away. “To call the situation dire is to understate the danger,” said Rachel Bronson, the head of the Bulletin, at the National Press Club in Washington, DC, Thursday, announcing the clock’s new setting. The clock dates back to 1947, when the scientists who participated in the Manhattan Project wanted to create a mechanism to warn of escalating global tensions and the danger of global Armageddon. The iconic stylized timepiece has since become the global arbiter of dread—or hope. It aims to answer two questions: Is the future of civilization safer or at greater risk than it was last year? And how does today’s risk compare to the risks we’ve experienced over the last 71 years? During Eisenhower’s eight years, the United States and the Soviet Union repeatedly had to take active action to step back from escalating tensions. Many times, in fact, Eisenhower sat in rooms as president where military leaders recommended war as the best option—where, incredibly, starting a war would have been easier politically than choosing peace. It seems hard to imagine today, but the US seriously contemplated the use of nuclear weapons in the Korean War, and even to defend the islands of Matsu and Quemoy in the Taiwan Strait from invasion by the mainland Chinese military. “How did it all happen,” asked a former German chancellor of the current chancellor. The latter, who had led his nation into the terrible, destructive “War To End All Wars,” replied, “Ah, if only one know.” Amid the Soviet standoff, President Kennedy told his brother Bobby that his driving motivation was to avoid a history book someday entitled The Missiles of October. The current system makes nuclear war easier to start than to avoid; there’s precious little room for reflection. The first ICBMs will leave their silos just four minutes after a presidential order; once they launch, there’s no mechanism to stop them. And country on the planet possesses the capability to shoot down an incoming strike. NEW YORK (Reuters) – Trading software provider Trading Technologies International Inc said on Thursday it has teamed up with crypto-currency exchange operator Coinbase to give institutional traders direct market access to both bitcoin and bitcoin futures beginning in March. The partnership means that large trading firms will have both bitcoin spot prices and bitcoin futures on the same screen, positioning them to potentially reap more profits trading the spread between the two financial products. The firms withheld the financial terms of the deal. Much of the interest in trading bitcoin has come from retail traders, but institutional participation has been picking up steam, especially over the past year, Adam White, general manager of Coinbase’s Global Digital Asset Exchange (GDAX), one of the biggest cryptocurrency exchanges, said in an interview. “This is the first time hundreds, if not thousands of institutional clients will have the ability to trade the crypto spot market side by side with 45 other markets,” he said. Trading Technologies, known as TT, is connected to 45 markets worldwide, including CME Group (CME.O) and Cboe Global Markets Inc (CBOE.O), which both introduced bitcoin futures trading in December. The cash-settled futures give speculators a chance to short bitcoin, meaning they are betting the price of the underlying security will fall. One bitcoin was worth around $11,150 on Thursday morning, down from a high of around $19,000 last month. TT also counts Goldman Sachs Group Inc (GS.N) , JPMorgan Chase and Co (JPM.N), and most other Wall Street banks as clients, as well as many Chicago- and London-based proprietary trading firms. The Chicago-based firm will also be rolling out enhanced surveillance tools to help police crypto-trading in the coming months, Lane said. Coinbase, which is regulated under the New York Department of Financial Services BitLicense, also said it would soon introduce a new custodian offering with strict financial controls and secure storage for institutional traders wanting to trade digital currencies like bitcoin. After 10 long years, the Google-sponsored competition to land a robot on the moon for millions of dollars will end without a winner. The XPrize foundation, which hosted the competition in collaboration with Google, announced Tuesday that the grand prize of $30 million will go unclaimed since none of the five teams will be able to reach the moon by the March 31st deadline. While the nonprofit said that it “did expect a winner by now,” it may move forward with a new sponsor to fund a prize if possible or reframe the Lunar XPrize as a non-cash competition. XPrize argues that it still succeeded in some ways because it “sparked the conversation and changed expectations with regard to who can land on the Moon.” Indeed, a number of private spaceflight companies such as Elon Musk’s Space X, Richard Branson’s Virgin Galactic, and Jeff Bezos’ Blue Origin have sprung up in recent years with goals to usher in space tourism.